Originally released in 1988 on cassette tape on Warren Smith’s own Miff Music label, “Dragon Dave Meets Prince Black Knight from the Darkside of the Moon” is a unique musical statement about the Cold War between the United States and the former Soviet Union. While many members of the large ensemble would be considered “jazz” musicians, the music takes a much more theatrical approach by incorporating narration of characters and a story line between the central characters, Dragon Dave and Prince Black Knight. Jazz, blues, soul, free jazz, comedy and spoken word meld and shift from song to song to depict the actions and thoughts of the characters. 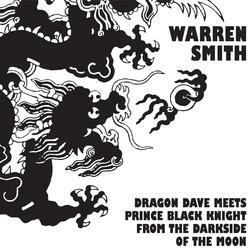 Porter Records is proud to bring to light this important recording from Warren Smith’s creative career.